The Tie family comprises two members: Tiel and Tie2. 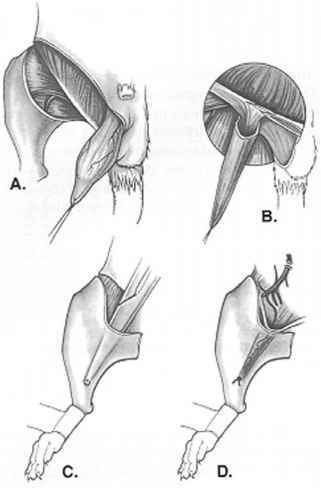 Both of these RTKs are essential for blood vessel formation and maintenance. There have been no ligands yet identified for Tiel, and relatively little is known about the cellular functions and signaling pathways utilized by this receptor. Tiel does inhibit endothelial apoptosis and promote vessel survival. Several ligands, the angiopoietins, have been identified for Tie2. Of these, angiopoietin-l (Angl) and angiopoietin-2 (Ang2) have been best characterized. Angl is an activator of Tie2, and Ang2 can activate Tie2 or antagonize the effects of Angl depending on the cellular context. Tie2 inhibits endothelial death, promotes endothelial migration, suppresses microvessel regression, inhibits vascular inflammation, and promotes microvessel integrity. Structurally, Tiel and Tie2 share several key features. The extracellular domain consists of two immunoglobulin-like domains separated by three epidermal growth factor motifs and followed by three fibronectin III-like repeats. Intracellularly, the receptors each contain a tyrosine kinase domain interrupted by a kinase insert region. Studies examining Tiel signaling have utilized chimeric receptors in which the extracellular domain of Tiel is replaced by that of a receptor with known ligand. Using this approach, Tiel exhibits a very limited ability to undergo phosphorylation and appears to have a low kinase activity in comparison with Tie2. Nevertheless, the receptor does interact with the adaptor Shp2 and the p85 subunit of PI-3K. The latter interaction initiates an antiapoptotic signaling cascade via Akt. Tiel also interacts with Tie2, and a pool of preformed Tiel:Tie2 hetero-oligomers exist in endothelial cells. Tie undergoes regulated ectodomain cleavage in which the extracellular domain of the receptor is proteolytically released. This generates an intracellular fragment containing the tyrosine kinase domain. This fragment may have signaling functions. Ectodomain cleavage of Tiel is stimulated by VEGF. tively associates with it. Pak activity is stimulated in this complex of Tie2/Dok-R/Nck/Pak. This cascade mediates Tie2-stimulated endothelial motility. The antiapoptotic activity of activated Tie2 is mediated via the PI-3K/Akt pathway. Phosphorylation of Y1102 on Tie2 creates a binding site for the p85 subunit of PI-3K. 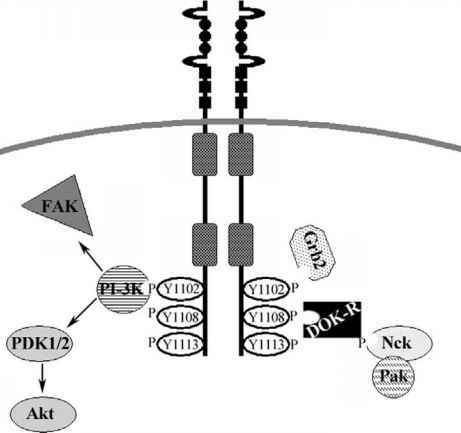 This leads to activation of PI-3K and Akt and suppression of apoptosis. Tie2 activation also stimulates tyrosine phospho-rylation of FAK, and this depends on PI-3K activity. Other signaling intermediates have been reported to interact with phosphorylated Tie2, including Grb2, ShP2 Grb7, and Grb14. Further work will be required to delineate the precise involvement of these molecules in Tie2 activity. Tie2 also recruits the NFkB regulatory protein ABIN-2. This recruitment is dependent on Tie2 phosphorylation and is activated by Ang1 in endothelial cells. Interaction between Tie2 and ABIN-2 appears important in the anti-inflammatory effects of Tie2, although the signaling pathway involved has yet to be clearly defined. Tie2 signaling pathways are summarized in Figure 3. Figure 3 Tie2 Signaling Pathways. In this schematic figure, the three main phosphorylation sites in the carboxy-terminal of Tie2 are shown together with signaling intermediates reported to interact with the receptor. Shaded boxes in the intracellular portion of the receptor denote the kinase domain. Optimal DOK-R recruitment requires interaction with pY1108 in Tie2 via the DOK-R PTB domain and membrane localization via DOK-R PH domain binding to phosphoinositide lipid products generated by PI-3k action. Tie2-mediated phosphorylation of DOK-R provides a recruitment site for Nck binding. Pak is constitutively associated with Nck. Other intermediates have been found to bind Tie2 in a phosphotyrosine-dependent manner; however, their roles in Tie2 action and downstream Tie2-initiated signaling cascades have yet to be defined in endothelial cells.